Discovering the work of Katharine McGuinness was a wonderful moment of kismet for me this year. 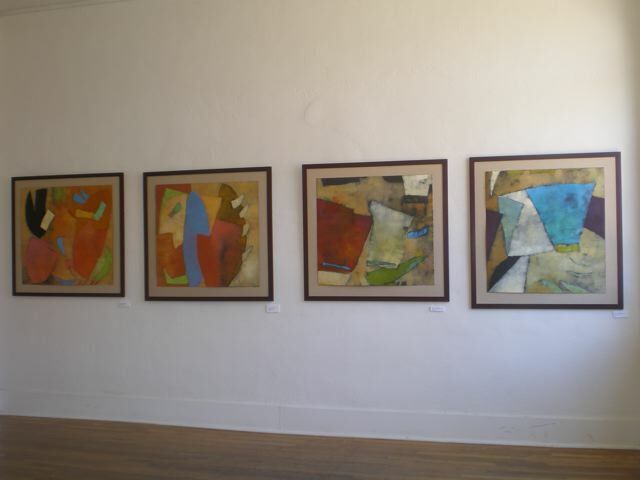 When touring Denver's Santa Fe Art District for their monthly First Friday Artwalk, I entered Spark Gallery and was immediately delighted by the saturated color and energetic shapes of these monotypes on paper, which were hung like mobiles throughout the gallery space. They twirled and danced as I walked around them, and I was captivated by their stunning compositions and rich texture. 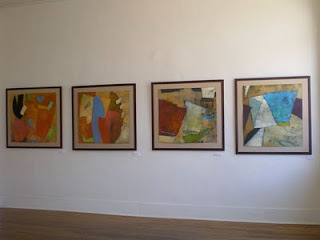 Katharine has an amazing eye for color and a mastery of abstraction. 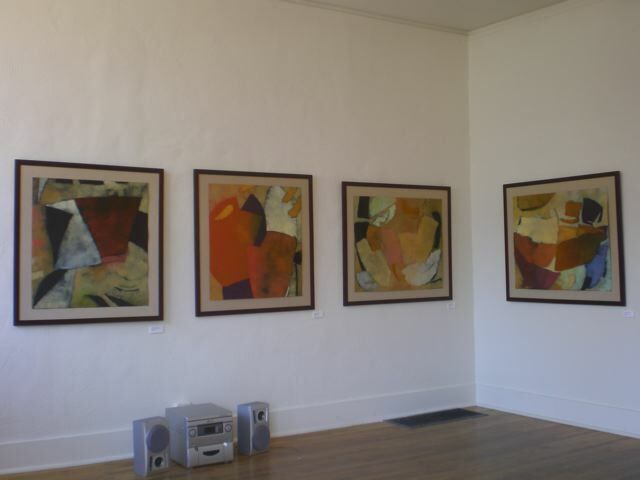 Often abstract works can lie flat and emotionless on their canvas or paper and get monotonous to view. 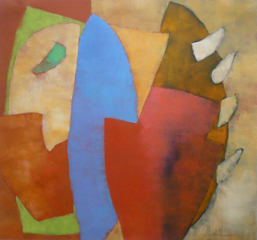 These shapes seem to interact and move with each other, and the viewer has merely caught a snapshot of their action. Drawn in for a closer look, you begin to see the layers of color artfully built upon one another and gain an appreciation for the craftsmanship of these pieces. Shortly after I saw Katharine's work at Spark, I wandered into her booth at the Cherry Creek Arts Festival, which is one of the largest, most prestigious annual arts festivals in the country and very difficult to be accepted into. This time I was able to meet Kate in person! She is a delightfully energetic woman, who happily shared information about her work and success with me, and I am still inspired by that conversation! 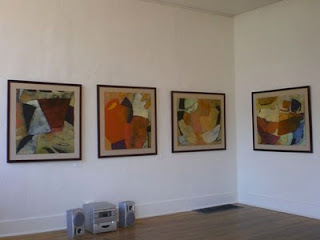 Kate currently has a show at Zip37 Gallery, in Denver's Navajo Street Art District, through October 31st. 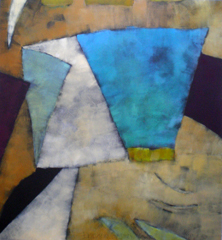 Her work is priced very reasonably ($800-$900, framed), and I highly recommend adding one to your art collection! I had the opportunity to talk with her about her work at the show's opening, and laughed frequently at her analogies and wonderful stories. Elysian: "I am not familiar with the monotype process, can you explain it to me?" McGuinness: "A monotype is a painting done with lithography inks onto a printing plate. I determine my composition, mix my inks and roll them onto the plate with a brayer. I control which inks go next to each other, and then transfer the colors in many layers with a press onto 100% rag paper. The paper is pure white to start, but there is none left when I am done! Some images may be similar, but each one is made completely by hand. There is no edition, and each piece is unique." Elysian: "What artists are the biggest influences on your work?" McGuinness: "One of the biggest influences on my work is music. My process is similar to jazz. I used to play the guitar, so I relate to the rhythm and movement of music. As far as artists go, I hate to look too much at others, because I want my work to be it's own, and artists can't help but steal ideas from one another. I do love Rothko and Villard." Elysian: "I also see a lot of Kandinsky (one of my favorite artists whose imagery was strongly influenced by music)"
McGuinness: "Yes, in fact I named one of my pieces after him!" Elysian: "How do you know when a piece is finished?" McGuinness: "It is so important that a piece doesn't look overworked! Its like a delicate pizza dough that you skillfully toss in the air and as soon as it's right you stop!" Elysian: "Which piece in the show is your favorite?" McGuinness: (pointing) "Swimming Up Stream"
Elysian: "That is my favorite! I love the black!"